In order to protect Hungary’s autonomy and ensure national rejuvenation, internal and external ‘enemies’ need to be countered. Internally, this includes all ‘treacherous’ and ‘unproductive’ groups in society: the corrupt political elite, the unemployed and the poor, pensioners, ethnic and sexual minorities, radical intellectuals and artists, etc. The main targets, however, are Jews and Roma – two of the largest minorities in the country and the traditional enemies of Hungarian fascists. Contrary to its ideological confrères in western Europe, the party does not shy away from invoking anti-Semitic rhetoric. For instance, in the run up to the 2009 EP elections, Jobbik MEP candidate Krisztina Morvai, allegedly advised ‘liberal-Bolshevik Zionists’ to ‘start thinking of where to flee and where to hide’, while in November 2012, the party’s then deputy parliamentary leader and spokesperson on foreign affairs Márton Gyöngyösi, infamously called on the Hungarian government to establish a special registry of Hungarian Jews, on the grounds that they ‘pose a national security risk’. Meanwhile, the Hungarian Guard have held countless provocative marches throughout Hungary dressed in combat boots and black uniforms, adopting symbols closely resembling those used by the fascist Arrow Cross in the interwar years (the group was officially banned in 2009, but was soon re-established under the thinly veiled name New Hungarian Guard). While such statements and actions have added fuel to already widespread anti-Semitism in Hungarian society and led to widespread condemnations both at home and abroad, Jobbik has vehemently denied any allegations of flirting with anti-Semitism. As for the Roma, Jobbik has successfully constructed a ‘moral panic’ about ‘the Gypsy question’. 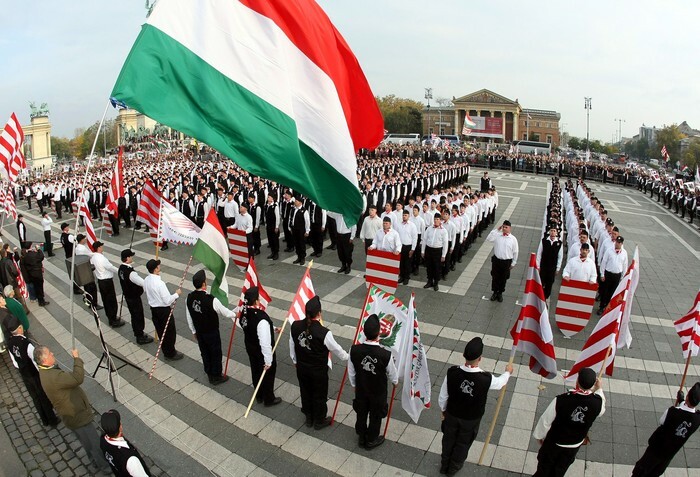 Its 2010 electoral manifesto argued that ‘[t]he coexistence and cohesion of Magyar and Gypsy is one of the severest problems facing Hungarian society’, which, if left unresolved, risked pulling Hungary into ‘a state of virtual civil war’. In order to combat what it describes as ‘Gypsy crime’ (an invented concept not measured by official statistics), it calls for the strengthening of existing police and the establishment of a Gendarmerie. To prove its intentions, the party has held numerous confrontational rallies in Roma-dominated neighbourhoods. The party’s rise has been accompanied by increasing physical attacks on Roma people. According to a 2011 report by the European Roma Rights Centre 48 attacks were carried out on Roma people and/or their property between 2008-10. These included a series of openly racist, terrorist attacks carried out by a group of neo-Nazi sympathisers, resulting in the death of nine Roma, including a five-year old boy, and left dozens others severely injured. Although the perpetrators were not official Jobbik members, the attacks nonetheless brutally demonstrate the increasing risk of racist violence in a society where anti-Roma racism seems to have become the norm. The concept of ‘social justice’ follows logically from the idea of ‘national rejuvenation’, and builds on the idea that Hungary should be compensated for all the wrongdoings suffered in the past. However, as party leader Gábor Vona makes clear in straightforward terms, this cannot be achieved through the policies pursued by mainstream parties, but requires ‘radical’ solutions. These include the restoration of ‘law and order’, ‘natural’ hierarchies, and the pursuit of ‘eco-social nationalist’ economic policies that ‘serve the interests of Hungarians’, rather than the ‘colonialist’ forces of neoliberal globalisation (transnational corporations, international financial institutions, the United States and the EU, etc.). In many respects, the central ideas and practices espoused by Jobbik show a strong continuity with the interwar Horthy regime. At the same time, the party also harnesses close ties to FIDESZ (the two parties have been cooperating on local level for several years), as well as elements of the ‘deep state’ in the judiciary, police, and the intelligence services. Thus, rather than an anti-systemic, radical-nationalist party, Jobbik has in reality been an agent of the FIDESZ government’s national-conservative agenda, with the party’s electoral and social influence acting complementarily to governmental strategy for quite a time. 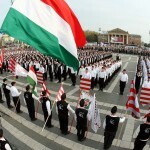 So what is new about Jobbik? Jobbik’s novelty is its ability to mediate the anger and disillusions of Hungarian society with the regime change, successfully combining traditional fascist ideology with innovative ideas and practices to mobilise its supporters, Transforming class inequalities into ethnic and cultural antagonisms, the party proclaims to defend the interests of ‘ordinary’ Hungarians (i.e. ‘honest’, ‘hard-working’, ‘white’, ‘Christian’, ‘conservative’, ‘middle-class’, heterosexual men). 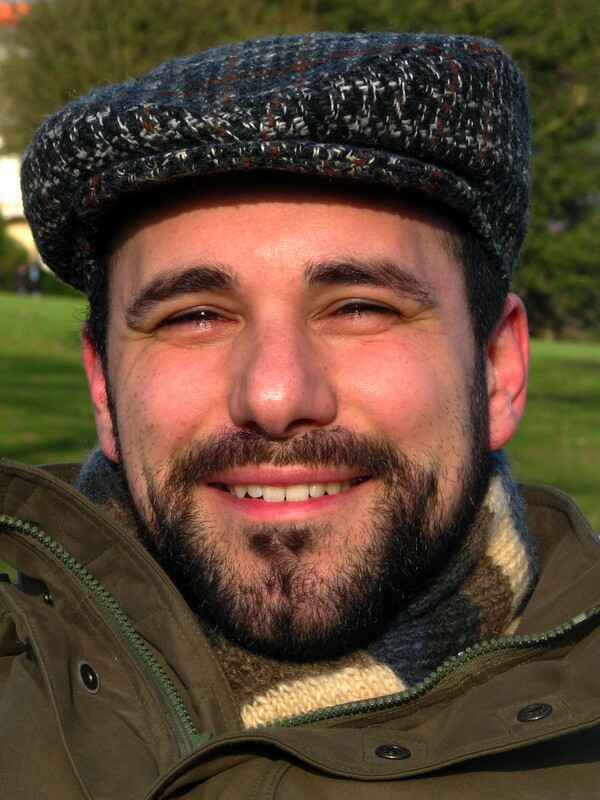 With its pseudo-revolutionary demands and non-compromising attitude, it has been able to present itself as a genuine, ’anti-systemic’ force, reaching beyond traditional far-right voters (predominantly older, socially-conservative men from the petty-bourgeois strata of society), making significant inroads among young, relatively well-educated people who are frustrated with the failures of the regime change and afraid of becoming déclassé. At the same time, the party’s emphasis on ‘law and order’ has been effective in mobilising support in north-eastern Hungary, where the impact of neoliberal restructuring has been particularly devastating and where there is a large Roma minority. Here, the party obtained around 30 percent of the votes in the 2014 general elections and also holds several mayoral posts (including in Ózd, another former centre of state capitalist heavy industry, where they thrashed the local Fidesz candidate). A young and mainly student-dominated group is overrepresented among Jobbik voters in every region of the country. The group of ‘losers’ is significantly present in the Jobbik constituency in the economically prosperous regions. However, in poorer areas with large Roma populations, a relatively well-educated, economically active and better-off group constitutes the core electorate. Thus, on the ‘demand side’ the common denominator of the different electoral groups seems to be neither ‘loser’ status nor a purely ideologically motivated choice (extreme nationalism, racism, anti-Semitism, etc). Though all these elements are widespread among Jobbik voters, the binding element between the different groups of the constituency seems to be a strong anti-establishment attitude. Consequently, a key factor to the party’s success has necessarily been an ability to successfully unite these electoral groups with different motivations and expectations. By now, this new far-right has coalesced into a coherent, ‘counter-hegemonic bloc’ against neoliberalism with well-defined contours and division of labour between its different components: an electoral party in the form of Jobbik, with more than 12,000 relatively young, dedicated members; a plethora of paramilitary organisations (from the New Hungarian Guard, through the Better Future-Hungarian Self-defence Movement, to the Army of Outlaws); and an increasingly sophisticated ideological apparatus, including numerous news outlets, like Alfahír, kuruc.info, Szent Korona Rádió, and the by now infamous N1TV channel (the previous employer of Petra László, the camera operator who caused a global outcry when being filmed kicking refugees escaping from the Hungarian police at the border to Serbia). Indeed, the Hungarian far-right can even boast of having its own college (King Attila Academy of Spiritual Science and National Strategy), where young cadres are provided a ‘nationalist spiritual education’ by leading far-right ‘intellectuals’ and groomed for future party role and dedicated service to the nation. The far-right as a counter-hegemonic blo .. When Jobbik first entered parliament in 2010, experts, media pundits and the mainstream political parties believed that the party’s popularity would eventually fade away, forcing it to gradually adapt its radical rhetoric to the more genteel discourse of parliamentary democracy. Instead, the opposite has happened. In the 2014 general elections, Jobbik won more than 1 million votes (20.22 percent) and cemented its position as the third-largest party, behind the ruling Fidesz-KDNP coalition (44.54 percent) and the second-placed social-liberal unity coalition (25.99 percent). Faced with the growing popularity of Jobbik, the national-conservative FIDESZ-KDNP government, led by Viktor Orbán, has sought to co-opt far-right voters by moving further to right. Indeed, as shown by it’s response to the ongoing ‘refugee crisis’, FIDESZ now stands further to the right on many questions than most far-right parties in Europe. Meanwhile, the fragmented parties of the self-proclaimed ‘democratic opposition’ have proven to be completely incapable of mounting any resistance to the Right. Since the 2014 general elections, their spiritless and cowardly leaders have abandoned the last pretences of resisting fascism and begun to seriously discuss the idea of having a ‘constructive dialogue’ or ‘debate’ with Jobbik, on the grounds that ‘the fascist party can no longer be kept in quarantine’. Instead, they now talk of the need to pay more attention to ‘problems of public security in the countryside’ (a respectable translation for ‘Gypsy crime’), in the vain hope that they will appear more credible than the fascists when it comes to the question of ‘law and order’. Neither approach appears to succeed in luring voters away from Jobbik. Rather, having recently ‘toned down’ its anti-Semitic and racist rhetoric, the party has surged to second place in the opinion polls and is by now the main party of oppostion to FIDESZ-KDNP. As the Marxist philosopher G.M. 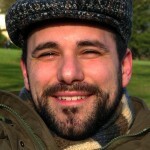 Tamás has recently argued, ‘Jobbik’s is primarily successful because it appears to be an anti-systemic party, … because it criticises certain aspects of capitalism (globalisation, the dominance of financial markets, unemployment) that any moderate social-democratic party does elsewhere, but, which nobody does here [in Hungary]’. Admittedly then, the present political conjuncture in Hungary looks pitch-dark. However, as demonstrated, for example, by the extraordinary aid response of civil society organisations to refugees locked up outside Keleti railway station in Budapest, there are still glimmers of hope for solidarity and progressive political forces to emerge in Hungary. If this is to materialise, however, there will be a need to channel our energies from everyday work and ‘emergency calls’ towards the elaboration of anti-capitalist tactics and strategies that might be viable in the long-term. This protracted ‘war of position’ (to borrow an oft-cited Gramscian term), can only be successful if it is genuinely committed to anti-fascism. Pingback: LabourNet Germany: Treffpunkt für Ungehorsame, mit und ohne Job, basisnah, gesellschaftskritisch » Die (ungarische) Rechte als Volksbewegung gegen Neoliberalismus?